With multiple construction projects happening on or around the Caribbean Beach Resort property, it has become one of those no man land’s type of areas that many guests stay away from. While we didn’t notice much in the way of inconveniences when we were there, the closure of the main dining facility would seem to put a crimp in any vacation. If you are willing to explore the resort fully, however, you may just find some treasure buried at the back of the resort in the Trinidad South section. Spyglass Grill opened late this spring and is following the recent trend of pool eateries that go above and beyond expectation. The restaurant is a walk-up window with a small covered porch overlooking Barefoot Bay and, one day soon, the Skyliner hub. Spyglass Grill serves breakfast, lunch, and dinner, alongside some sweet treats and cocktails. 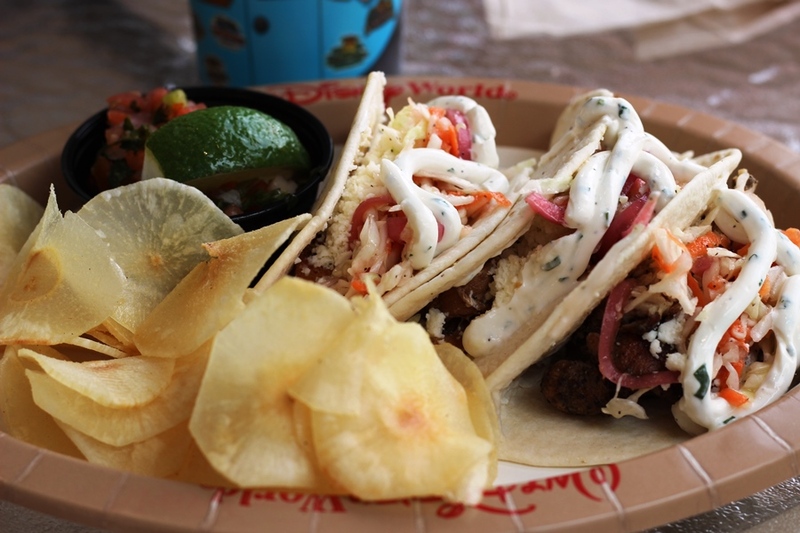 We visited for lunch and opted for the Caribbean Taco Trio and the Crispy Yuca Bowl. The taco trio is unique in that you get to pick the tacos you would like in your trio and how many of each. Protein choices include jerk chicken, beef with black bean, vegan black bean, and spiced fish. In order to give as full of a review as possible, we opted for one each of the beef, fish, and chicken. Each taco starts in a flour tortilla and comes with pickled vegetable slaw, cilantro-lime crema, cotija cheese, and pico de gallo. As a side dish the taco trio comes with plantain and yuca chips, although on the day we visited this seemed to be all yuca all the time and very little in the way of plantain chips. Let’s start with the biggest concern when you hear phrases like “spiced fish” or “jerk chicken,” the heat level. None of the choices were overly spicy. In fact, while you would get a hint of Caribbean flavors, much of these flavors were almost bland and became vehicles for the crema, pico, cotija, and pickled vegetables. I’m not complaining, these were wonderful accompaniments, but I was hopeful for a bit more heat coming from the protein choices. That said, keeping the flavors mild will allow for anyone to sample these tacos and not have to worry about heat. The tacos themselves aren’t giant shells the size of your head, so three makes for a perfect portion for lunch, and the freshness is something I didn’t expect from a small side restaurants at a moderate resort. Moving on to the Crispy Yuca Bowl, this was a complete winner. It comes with chunks of crispy yuca, think home fries, that are topped with black beans, pico de gallo, cilantro, and cotija cheese, with a lime wedge to squeeze on as you see fit. Think a bowl of hash or Caribbean poutine, and you’ll be in just about the right wheelhouse for this dish. The bowl is large, but it looks deceptively small. Once you start digging in, you’ll find that there is a ton of heavy food in here and you may even have a hard time devouring the whole dish. I didn’t, but it could happen! The yuca is crispy on the outside and warm and soft on the inside. The texture and flavors are similar to a potato, but just a little sweeter, though not as sweet as a sweet potato. 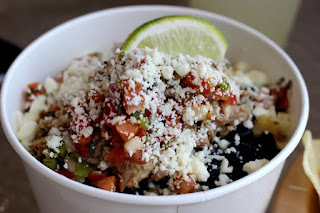 The black beans are firm and well-seasoned, the cotija cheese is rich and creamy, and the pico, cilantro, and lime just add to the party in each bite. This is a hearty meal, and may not seem like much, but it was delicious from the first bite to the very last scraping from the bottom of the bowl. Spyglass Grill also serves up Cuban sandwiches and burgers, desserts, specialty coffees, and cocktails. I for one had an Island Margarita on the Rock with my meal, and while it wasn’t anything to write home about, it definitely was better than most pool bar drinks I’ve had. I will admit to having low expectations of Spyglass Grill when we arrived, but my opinion was quickly altered. The ingredients are fresh, the flavors pop, and there was very little I had to complain about. Maybe Spyglass Grill isn’t on the top destinations for dining in Walt Disney World, but I would definitely revisit the restaurant, regardless of whether or not I was staying at Caribbean Beach. The next time you’re in the area, I highly recommend pulling your boat up to the dock and discovering your own dining treasure.